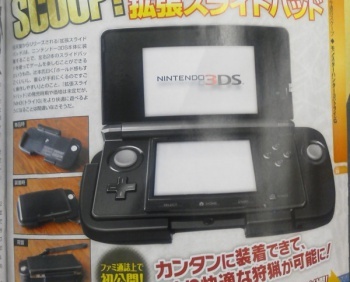 It seems that adding proper 3D controls on the 3DS also involves making the device look like a Game Gear. There's a sweet spot when it comes to analog sticks. One isn't quite enough and three is one too many, but two is just right. This hasn't escaped Nintendo's notice, and has seemingly inspired the creation of the "Expansion Slide Pad," an add-on for the 3DS, which gives the device a second thumbstick. The Expansion Slide Pad is essentially a cradle that fits around the 3DS. As well as the extra thumbstick, the add-on adds another shoulder button, although it could be a replacement for the existing right shoulder button, rather than an extra button in its own right. The cradle also gives the 3DS a more ergonomic shape, although this increased comfort comes at a cost of adding a significant amount of bulk to the device, making it wider, thicker, and probably quite a bit heavier. So far, the only game is definitely compatible with the Expansion Slide Pad is the upcoming Monster Hunter 3G, whether other games will make use of it remains to be seen. Some believe this is a sign that Nintendo is planning a radical revamp of the 3DS with the second stick integrated, while others think it will be a specialist item akin to the Guitar Grip peripheral released with the Guitar Hero games on the DS. Nintendo has rolled out dome pretty bold redesigns in the past - the DSi added a number of new features to the DS, as well as taking some away - but changing the entire control scheme is a few steps beyond bold, and into ballsy territory. It's going to take a whole lot of GBA games to placate the early adopters if that happens.